Some games (even more recently) are cooperative and force players to work together against the game. It’s fairly obvious why this would be helpful. It teaches teamwork and cohesion and all that boring stuff they hammer into your brain at school. But what I want to talk about is how cooperative games, especially Pandemic, affect the way we talk. So in Pandemic you and your buddies are a team of researchers, scientists, doctors, and other people out to save the world from various diseases. You have to work together with your various skills to complete your task and ultimately save the world. It’s all a very noble game and is great to play with anyone as no one will object to the theme (I can just imagine someone who doesn’t want to save the world from disease screaming at you about something like a crazy person in a cop show). To get all of this done requires a lot of communication. Now, I’m sure you have communicated with people before, possibly on a daily basis, but you never realize how vaguely you speak until you have a goal to accomplish with other people. I have made a conscious effort to make my speech more concise since I was at a job parking cars and had no idea what to do because of poor instruction. I would only realize several years later how well cooperative board games help with this. First you have to make a plan. This involves critical thinking skills which this game also helps build. Then you have to figure out everyone’s role in the plan and if they could be doing anything more productive. Then you have to communicate this plan to the other players. The plan must be well dictated so as to not confuse the the players and to allow them to also think about what would be the best thing to do. Since all of the moves in the game are fairly similar you have to be clear about which moves to make when. And since you can’t show the other players your hand of cards you must make sure they know exactly how many cards you have of what type. You don’t want to make a mistake and end up with a plan that is unelectable because of some miscommunication. The skill to speak clearly and be understood is a great one to have. It is not necessarily a skill with any applied purpose but it is just useful. Like being able to walk doesn’t qualify you for a lot of positions, but it helps. 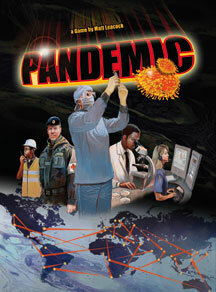 Pandemic and other cooperative games will help you improve your coordination, leadership, critical thinking, and articulation skills. On top of all that, it’s fun. After playing several games I definitely feel like I can more clearly explain my plan to someone else or give orders in a workplace. To speak clearly and articulate concisely is a very useful skill and if you want to learn while having fun, there is almost no better way than with Pandemic.